The Owl and the Pussycat have arrived in the land where the Bong Trees grow! 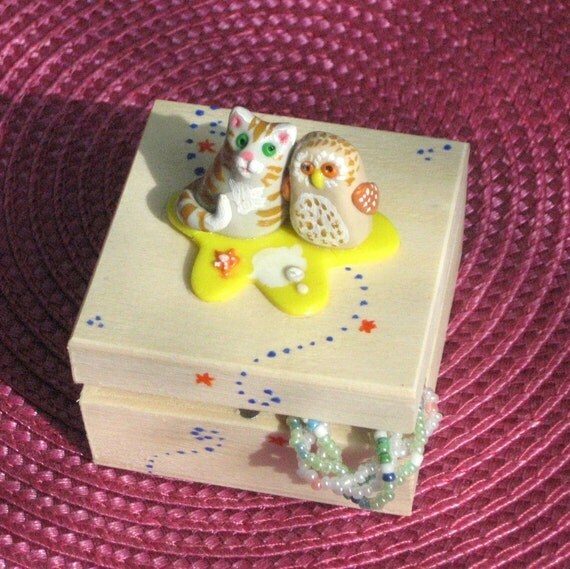 This cute little wooden box has been decorated with a scene from Edward Lear's famous rhyme, modelled in polymer clay. It has been finished with acrylic paint and varnish and firmly fixed the box lid. Measuring 6cm square x 34mm high, hinged and with a magnetic closure, it is perfect for small trinkets and treasures and would make a lovely gift for Christmas. Not recommended for children under 3. Folksy :: Buy "White Baby Bootee & Gift Box"